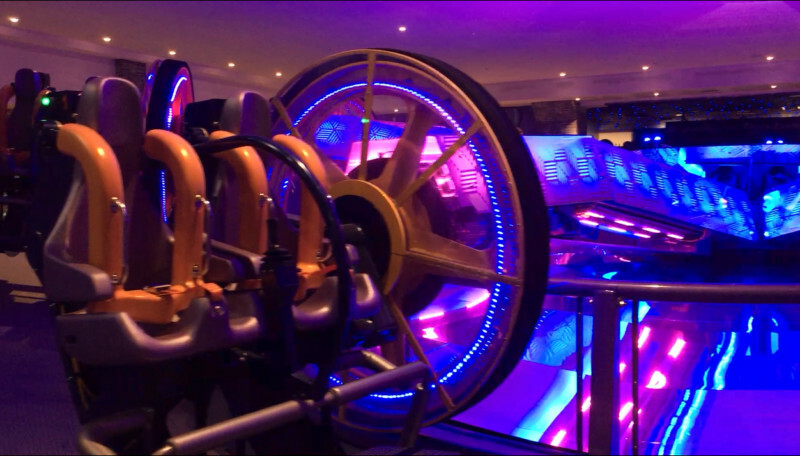 Galaxyland in West Edmonton Mall debuted their newest ride with a free ride event on December 1st. The ride is the Chance Rides Unicoaster, decked out with 15,360 RGB LED lights, provided by EWorks Pro. Each individual light can produce up to 32 different colors, with the light display bouncing off the chrome-like center hub and sweeps. The Unicoaster is a rider controlled experience, allowing riders to control the spinning action with a joystick. The ride can go from mild to wild at the riders’ choosing – pressing the joystick forward makes the seat roll forward, pressing the joystick backwards makes the seat roll backwards. Leaving it steady results in a calm ride over the undulating track. The people at Galaxyland put more control in the hands of their ride fans when they conducted a contest to name the new ride. The overwhelming favorite and winning name is Zero Gravity. The post on Facebook announcing the contest received over 800 comments and name suggestions. The winner of the contest has received a one year pass for unlimited rides at Galaxyland. More information about Galaxyland and their new ride can be found on their Facebook page: www.facebook.com/wemattractions.